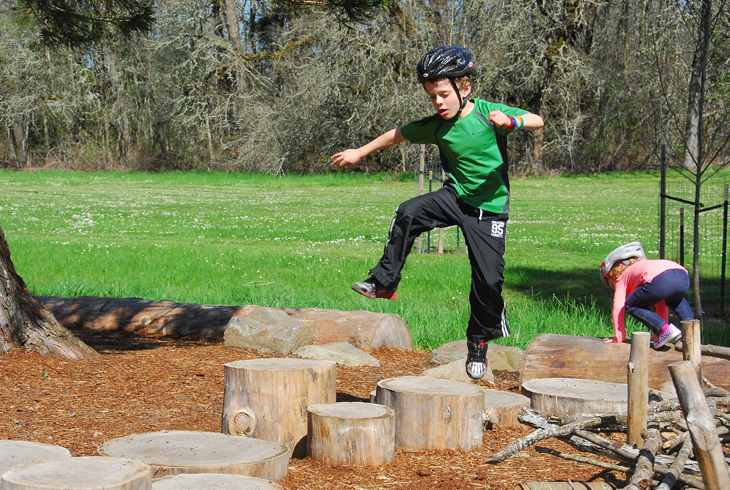 Pioneer Park is one of several THPRD sites that uses natural elements to encourage unstructured and imaginative play. Several studies show that nature play contributes to the intellectual, physical and emotional development of young people. THPRD is committed to investing resources into projects that yield opportunities for young people to connect with nature at an early age. The Natural Learning Initiative lists the following benefits to nature play. Before it was part of the district’s vision, natural play became a priority for Natural Resources as a means to protect natural areas. The district’s first designed nature play area was at Hyland Woods Natural Area, where off-trail activity was damaging wildlife habitat. When the district opened Cooper Mountain Nature Park, project partner Metro was interested in adding nature play. The result is a much more structured area than at Hyland Woods. Now, he added, the district takes an opportunistic approach to nature play.